The seemingly unbeatable New England Patriots defeated the Jacksonville Jaguars Saturday 31-20. The Jags played a close game, going back and forth scoring with the Pats in the first half. They even took my MVP Randy Moss out of the game playing him in double and triple coverage. But the Pats have weapons, and as much as I want to throw up saying it, they’re some pretty damn good ones. America’s darling (and my archenemy) Tom Brady threw for 92.9 completion percentage which broke Phil Simms’ longstanding completion percentage record in a playoff game. Laurence Maroney had another huge game on the ground, rushing for 122 yards and a touchdown. The Pats also eliminated the Jags vaunted two-headed rushing attack, leaving Fred Taylor and Maurice Jones-Drew with a combined 66 yards on the ground. The game basically came down to Jacksonville having no answer for Brady and his 262 yards passing. The Jags also lost the turnover battle 2-0 and when you’re playing a perfect team, you have to play them perfectly. Continuing in Saturday’s games was Brett Favre and the Green Bay Packers facing my pick for most boring playoff team, the Seattle Seahawks. Everything about the ‘Hawks from their colors (what is that random lime green about??) to their players (snooze) is really irritating and I was hoping the Redskins would handle them last weekend, but my wish was a week late. The Packers beat the Seahawks 42-20 on Saturday. Brett Favre, at 38 years old is getting younger by the game. He was in his element (a snowy game at Lambeau) and he picked apart Seattle’s big defense. Favre had 193 yards and 3 touchdowns and he even took a minute to hit Donald Driver with a snowball. However the big name in this game was Ryan Grant. If you’ve never heard of him, you will. Just a few months ago, all the sports writers talked about the lack of a running game in Green Bay, and how they wouldn’t go far in the playoffs without one. Well in the snow globe that was Lambeau Field, Grant silenced all critics of the teams rushing attack with 201 yards and 3 touchdowns. His 201 rushing yards was a team postseason record and ranks 7th all time in the playoffs. All this came after Grant fumbled twice on the Packs first two possessions. "I thought, 'Oh boy, this ain't too good,' " Favre said. "This is the exact game I didn't want to be in." Grant said of his early ball-gripping woes, "I appreciate everyone sticking with it, staying with me.” Seattle opened the game up with two early scores of those fumbles making it 14-0 in a couple of minutes, but from that point the Packers turned it into the Lambeau Show, turning in six touchdowns on their next six possessions. 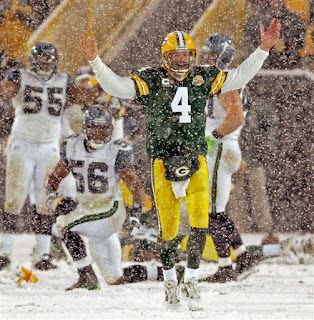 Favre is 43-5 when temps are lower than 34 degrees at Lambeau and he’ll have a chance to improve that record now that the Cowboys have been eliminated.